How Love Burns . 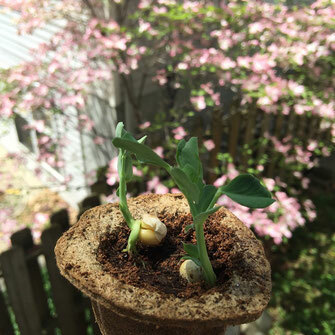 . .
For several weeks now, long before the heat and light of spring is consistent and caring enough to have fully arrived, my wife has been nursing a wide array of seeds. Planted in small hummus cups that look, not surprisingly, for all the world like egg cartons, these seeds are palmed and protected from the inclement weather. They have of late found purchase as they reach for the sun streaming through our kitchen window. To the left are some sprouting sugar peas framed against the background of my neighbor's blossoming dogwood. I love the alpha and omega of this photo. I dare you to overstate the mystery of seeds. On second thought, you can't, so don't bother trying. There's no mystery like seed mystery, something so contemptibly small stuffed with such incipient life. Seeds are being cast all around us: soybeans, cotton, corn and rice, faith, hope and love. They're too small to notice unless you're intent on finding them. They're profligate, with thousands more sown than take root. They're in the air, selflessly insistent that life continue only by virtue of attention to minute, often mute, beginnings, specks of intent planted and tended with a quiet resolve not to seem, but to be. John Calvin says that when a seed falls into the ground it is cherished there, by which he means that everything the seed contains by way of expectation is foreseen and honored. One might as well say the earth invades the seed, seizes it as occasion to compose itself in some brief shape. Groundwater in a sleeve of tissue, flaunting improbable fragrances and iridescences as the things of this strange world are so inclined to do. So a thriving place is full of intention, a sufficiency awaiting expectation, teasing hope beyond itself (The Death of Adam 234, emphasis mine). Jesus' life was a speck: short-lived, suspicious of birth, native son of a no-name hometown, executed as a criminal. His movement? Hardly auspicious, lasted a moment, with less than a dozen serious followers before he was arrested, practically no one after his arrest, unless you count a few women and one "Beloved Disciple" (which Jesus did, by the way). Maybe this is why he told so many stories about the perils and glory of farming. He lived with the full intent of seed and soil, and called us to the same conspiracy, to be both the lowliest of seeds and the most fertile of soils, vital connivers in the Divine-Human-World conspiracy that "teases hope beyond itself." Yet, because God always and unreservedly honors growth and health and all that is Good, True and Beautiful, this Jesus we sought to bury for good, ended up being planted by God. And we, if we have even a smidgen of love at in our lives, benefit from such lively risenness. We have a choice in all this. We can cultivate the Love. Do all the ordinary, overlooked work, the hard stuff that best occurs in the wings, off-stage, that helps Love sprout and thrive. Conspire with the God who cherishes Love. Or, of course, we can choose to conspire in our own diminishment and bury it again. String it up, mock it, lock it up behind the rolled stone of our jaded and cynical hearts. Either way, the Lord of Life will figure out a way to turn our graveyards into gardens, our abandoned and bullied cities into beloved communities, and all our refuted and refused occasions for Love into seeds of life. Do this. See if you can see the seed of Love, how it burns to spring ever new, even now. Well, as you can see from this photo, the communion set I shattered last week is well on the mend. Clearly, it's not there yet. In fact, I'm not sure how much more can be repaired. Strangely, however, the chalices, carafe and paten are more holy to me now in their apparent unwholiness than they ever were before I broke them in my negligence. You'd expect me, I bet, to go straight to St. Paul's words about how we have this treasure in earthen vessels, so I will: "But we have this treasure in clay jars, so that it may be made clear that this extraordinary power belongs to God and does not come from us. We are afflicted in every way, but not crushed; perplexed, but not driven to despair; persecuted, but not forsaken; struck down, but not destroyed; always carrying in the body the death of Jesus, so that the life of Jesus may also be made visible in our bodies" (II Corinthians 4:7-11 NRSV). I LOVE this passage, how it affirms the brutal honesty of the many and varied hits we take, but also the even deeper "life of Jesus" mystery that grants us abiding resilience and resolve. It reminds me of another verse earlier in that same letter where Paul, struggling with his own weaknesses and sin, somehow hears the Lord say to him, "My grace is sufficient for you, for power is made perfect in weakness" (II Corinthians 12:9). I can't tell you how many times I've gotten (and keep getting) this one wrong. My default position is to think and feel that power is made perfect in strength. Which is exactly why I find Paul's words so refreshing and utterly healing. Today's the birthday of poet and novelist Robert Penn Warren. I love his work for its "witness," what some might call the "strange witness of unbelief." Warren was at best an agnostic, but he spoke so deeply to the human heart in a broken world. As I looked over The Poetry Foundation's extensive biography on Warren, I was reminded of how, in his book The Poetic Vision of Robert Penn Warren, Victor Strandberg underscores the passage from innocence to maturity that lies at the center of Warren's literary vision. Strandberg sees Warren as dividing his characters into two groups: "those who refuse passage into a polluted and compromised adult environment" (whom Strandberg refers to as the "Clean" people) and "those who accept passage into the world's stew" (the "Dirty" people). As Warren sees it, the Clean people see themselves as separate from the corrupted world, while the Dirty people are willing to face life as is in order to grow spiritually. In Warren's view, the Clean people can either be relatively harmless, reclusive fundamentalist types, or they can be almost psychopathic in their determination to purify the world and punish sinners (i.e., the Dirty People). I'm one of the Dirty people, I guess. I sense God drawing me more deeply into a kind of radical acceptance of the "world's stew." Not that I seek to make things worse, or believe that things can't be made better--but I'm convinced that I can best press forward via the acceptance of our shared brokenness. 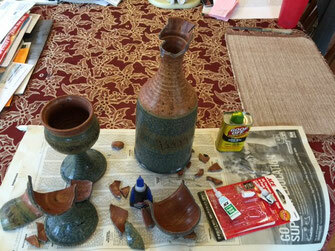 Humpty Dumpty came to mind while trying to glue the communion set back together this week. What I wouldn't have given for "all the king's horses and all the king's men"! I thought of just how many times each day, in Christian communities all over God's good earth, and in countless other lives in other places, Christian or not, the Sacred Presence comes to folks doing their best to bear up beneath the broken day as it comes and goes, offering the invitation to renewed life, saying words that embody and echo "Take, eat, this is my body broken for you. Take, drink, this is my blood spilt for you." Whatever this Communion is that we both serve and sever, over and over, at its center lives a Broken Heart that heals, that mends, that lifts us back up and offers us in love to a world that's glorious these spring days with robin-blue skies, greening lawns, bird chitter and squirrel chatter; yet horrid too, with a hateful hankering, as Paul put it, to crush, perplex, persecute and destroy. I don't know if we have enough glue, or enough of a sense of jig-saw proportion or patience, to ever get this communion back together, but I celebrate the fact, all in all, that the Sacred Heart continues to beat, and to hold us all close in all those places where broken is blessed: we're well on the mend; we're well, on the mend. Maybe you’re one of the few persons I have not yet told of our recent remodeling effort. Let’s assume you are. We began simply enough, with innocent thoughts of new carpet in the master bedroom and closet. Something plush and clean (not threadbare and pet-stained) with a soft memory-foam liner to cushion our bare feet. This impulse led to new paint, new banisters, new bathroom fixtures and mirror, even a new bedroom windowsill. Also, out with the old: our couch that arrived a color of blue we never ordered, nor could ever fully name, was carried to the curb. It stuck out a thumb and was picked up within 30 minutes. Not so that comfy chair we bought 30 years ago for our first home in Salt Lake City, Utah--the one we found on clearance way in the back of the store, that we toted with care to other homes in Princeton, NJ, Oxford, MS, Annapolis, MD, and, finally, here to St. Louis, MO. It still sits sun-soaked at the curb, no takers on the third day. Life goes on. A friend of mine asked yesterday if we were preparing to sell the house and move. I said, “Nope, just trying to stay alive right here.” One of my favorite poets, Christian Wiman, once wrote “that in the end we go to poetry for one reason, so that we might more fully inhabit our lives and the world in which we live them, and that if we more fully inhabit these things, we might be less apt to destroy both” (Ambition and Survival: Becoming a Poet 120). I’ve not found a better reason to read and write poetry. Everything about me wants to inhabit more fully this life and this world—not flee it, judge it, use it up from a distance. 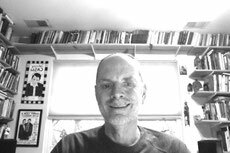 Everything about me wants to inhabit this world—not some ideal world, not some ideologically pure or politically correct world, not some virtual wannabe world, not some spiritualized pie-in-the-sky precinct beyond this world, but this world which wobbles and warms and yet somehow manages to keep turning. Every bone in my body wants to sop up this life like marrow, not some sanitized, cosmeticized, “made over” life, not some carefully controlled and contrived life, but this life where love deepens as losses mount, this beautiful, terrible one I’ve been given to love with “fear and trembling”: balding, cancer-marked, aging and arthritic, prone to Southern-accented fits of egoic whining and unkindness, apt even to fall spellbound to the siren call of the Home Depot Carpet Guy—this life rife with faithful family and friends, morning sunrise and evening moonglide, daily runs and walks with Maya the Wonder Dog, evenings spent with my wife recapitulating the day and missing our grown children, a life with more books than I can ever hope to read, ever pressed by the urgency of Word and words—this life, this world, this habitation. God comes, calling me to inhere lovingly all this wholiness. My friend was onto something, however: getting new carpet is a lot like moving, but not. My wife and I seek to keep moving yet rooted, which means passing through occasional patches of havoc in order to let go and inhabit our home anew. Appliances wear out, rooms no longer occupied are anointed for new callings, you get caught up Feng Shui-ing your bedroom, you realize your library is fast becoming The Tomato That Ate Cleveland. And everything you remodel or box up for the Salvation Army is a nagging reminded of mortality and brokenness. We’re pruning our history, mucking around in memories that make this life our own, this world our home. Alone one day, as I wrestled a mattress nicknamed The Incredible Hulk down the hall, I was fit to be tied. Then something common happened: in my haste and frustration I tugged too hard. That’s how I managed to bump the beautiful communion set gifted to my family when we left Broadneck Baptist Church in Annapolis, the summer of '94. 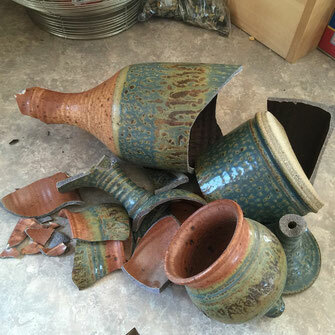 Beautiful shards of pottery burst all over the living room floor, broken by the sheer desire to keep moving and stay alive. I stood there, stilled and crestfallen. Eventually my shame gave way to sorrow. Then a tenderness best named as gratitude rose up from its resting place below. Faces and hands appeared, all opening wide before the cup and the host contained by this gift of clay, palm-shaped and baked in the kiln. 21 years of accrued Eucharistic joy, drawn near by the costly severance. Yes, we sometimes find ourselves at our worst, breaking all that’s best, that’s a fact; but God always ends up with the last word: extending yet one more invitation to stay alive by inhabiting the Unbreakable Love. Lord, in all our striving to love and live fully within this world you’ve given us, to keep moving yet rooted deep, heal our havoc, honor with your wholiness even our sin, forgiving and restoring our tendencies, both willful and inadvertent, that break up and scatter this life and this world we’re called to inhabit more fully, to love. Amen.